Pub, Restaurant & Function Room With Great Beer, Great Food And Live Music.. 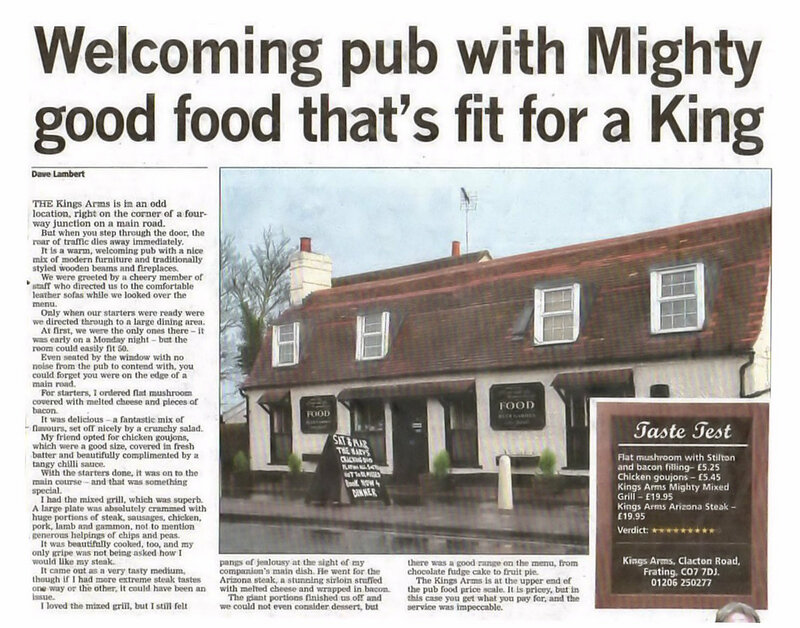 Welcome to the King's Arms at Frating, situated just 20/25 mins from Colchester, Harwich and Clacton in Essex. We are a traditional 16th century Pub & Restaurant with great beer, delicious freshly cooked food, log fires, large beer gardens, ample private parking, a fully serviced function room and a warm and friendly atmosphere. We are also well known for our Live Music Nights, Charity Music Festivals, Karaoke & Open Jam Nights and Seasonal Events. Please browse our website for further information or if you have any questions please get in touch. We offer a great choice of delicious bar meals for those looking for a lighter or quicker option. The restaurant at The King's Arms is open every day and ALL DAY on Sunday when our hugely popular traditional roast dinners are available. Our extensive menu offers a great choice of freshly cooked meals. We also sometimes do barbecue's. We are now taking bookings for Christmas and New Year, please reserve your table NOW to avoid disappointment. 9 out of 10 by the Clacton Gazette! ... and a glass of wine from the personally selected wine list, or one of the draught real ales including the featured guest beer. King's Arms at Frating is equipped to cater for all types of parties & functions in our purpose built function room. Leading out onto our large, well kept gardens, the function room is perfect for weddings, parties, corporate events and any other occasion. Read More..
covering a wide range of styles to suit all tastes.